di Bocconi Students Investment Club 13 Dicembre 2017 8 min. On the November 26, 2017, Meredith Corporation entered into a binding agreement to acquire Time Inc., Meredith’s former rival and one the biggest incumbents in the media sector, for a $2.8bn. The bidder (MDP) has agreed to acquire Time Inc.’s total shares outstanding for $18.50 per share, representing a 48% premium to Time Inc.’s undisturbed three-month average share price (46% premium over November 15 closing price and a 66% premium over the 10-day volume weighted average trading price ending on November 26). The acquisition represents a 100% cash tender and is backed by $650m from Koch brothers who will end up with a 10% stake of the combined entity. The deal has been approved by the two companies’ boards and is expected to close in the first quarter of 2018. Meredith Corporation is a diversified media company primarily focused in the home and family marketplace. It has been providing journalism services for 115 years and operates through two segments: Local Media and National Media. Meredith’s Local Media Group owns 17 television stations reaching more than 11% of U.S. households, whereas, the National Media Segment includes magazine publishing, custom content and customer relationship marketing, digital and mobile media, brand licensing, and other related operations. The firm’s publishing portfolio consists mainly of food, home, parenthood, health markets and services mainly women, including titles such as: Better Homes & Gardens, Martha Stewart Living and Family Circle, and it has long coveted Time properties such as People and InStyle. Meredith’s balanced portfolio consistently generated substantial free cash flow, and the company is committed to grow total shareholder return through dividend payments, share repurchases and strategic business investments. Meredith’s Corp YoY revenue change is 3.86% increasing from $1.65bn to $1.71bn (5-year CAGR of 4%). During the same time frame, net income improved by 456.70% from 33.94m to 188.93m. Meredith’s current annualized dividend per share of $2.08 yields 3.4%. In addition to its strong operating performance, the firm has proved to be resilient in its dividend policy as it paid dividends for 70 straight years while increasing it for 24 consecutive years. Time Inc. is a 94-year-old multinational mass media and content company, home to 100 iconic brands such as Time, People and Sports Illustrated magazines. The company offers a portfolio of news and lifestyle brands across a range of different interest areas which are offered through other platforms including licensing, video and television, live events, and paid products and services. It also offers its advertisers a wide range of analytics and research services, including consumer insights, audience measurement and accountability reporting. In 1990, Time Inc. merged with Warner Communications to form today’s media conglomerate Time Warner. The company was then spun off in 2014. Since its inception as an independent company, Time Inc. faced operating constraints as it struggled with declining revenues and a substantial debt burden. To defy investors’ expectations, it has undergone a strategic plan that includes revamping its cost structure and focusing on its digital business. The recent strategic reorganization, aimed at growing digital revenues and reaching a wider audience, has shown some progress, but has been overshadowed by the woes of its traditional magazine business where revenues have dropped 14% since the last fiscal year. At the end of Q3 2017, the group reported total revenues of $679m, a YoY decline of 9%. The transition from the print age to the digital age has been grueling. Major publishers have been making hard choices about cuts and analysts expect even more cost-cutting to be forthcoming. In the words of Alina Khavulya, Moody’s Vice President, “The publishing industry’s efforts to invest further in digital products while cutting costs are unlikely to offset the continuing secular decline in print advertising revenues […] We believe that only a strong improvement in the US economy would boost revenue prospects enough for us to change our negative outlook to stable […] Overall, we expect magazines to continue to perform better than newspapers, due to continued demand for glossy weekly and monthly publications from readers. However, unlike newspapers, magazine publishers have not had the benefit from the rollout of digital paywalls to the same degree”. Time, Elle, Glamour, Vanity Fair have been in the business for decades and fondly remember “the golden age”. There have been drastic changes to budgets, bottom lines and expectations, which have been considerably painful. Few in the magazine industry have been spared by the downturn in prints and the increasing difficulty of building a sustainable digital business. Condé Nast, the owner of Vanity Fair and Vogue, is slashing budgets and staff; Vanity Fair’s new editor has been given the task of trimming its costs by 30%. Rolling Stone, the iconic rock-and-roll magazine, is being sold by its founder. Rodale, the family-owned publisher of Runner’s World and Men’s Health also experienced M&A activities. Time Inc.’s 3.5-year run as a standalone publisher has been rocky as it has been negatively hit by the erosion of prints and has not recorded positive revenue growth over the past 6 years (see company’s description). Overall, all the major incumbents in the media industry have been hindered in terms of revenue and growth due to the structural challenges affecting the sector and for this reason they are relying on industry consolidation as a mean to foster operational efficiency. 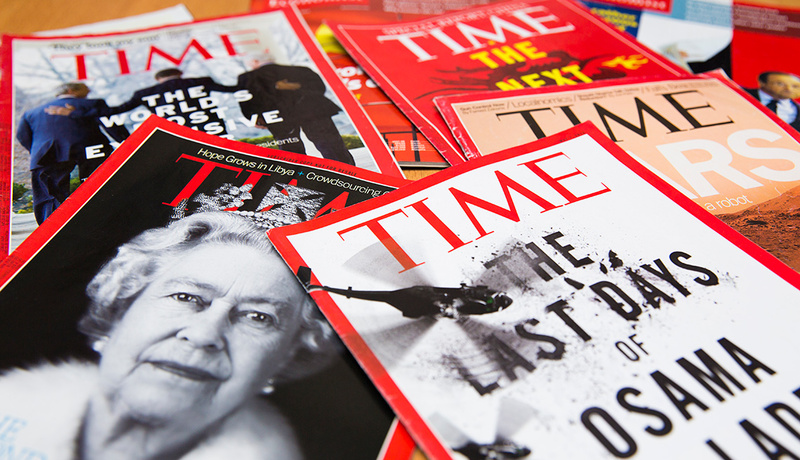 Meredith Corporation announced a week ago that it has entered into a binding agreement to acquire all outstanding shares of Time Inc. for $18.50 per share in an all-cash transaction valued at $2.8bn. The transaction has been unanimously approved by the Boards of Directors of Meredith and Time Inc., and is expected to close during the first quarter of calendar 2018. The transaction will create a diversified media and marketing company with calendar 2016 combined revenues of $4.8bn– including $2.7bn of total advertising revenues with nearly $700m of digital advertising revenues – and adjusted EBITDA of $800m. Additionally, Meredith anticipates generating cost synergies of $400m to $500m in the first full two years of operation. Meredith has secured a total of $3.55bn – which includes a $350m undrawn revolving credit facility – in fully committed debt financing from Credit Suisse, RBC Capital Markets, Barclays and Citigroup. Meredith has also secured $650m in preferred equity commitment from Koch Equity Development (KED). KED will not have a seat on the Meredith Board and will have no influence on Meredith’s editorial or managerial operations. Funds will be used to finance the transaction and refinance existing debt. At least some of the motivations behind this transaction could be found in Meredith’s CEO statement claiming that the new entity will be a premier media company serving nearly 200m American consumers across industry-leading digital, television, print, video, mobile, and social platforms positioned for growth as well as a powerful digital media business with 170m monthly unique visitors in the U.S. and over 10bn annual video views. Let’s give numerical meaning to the above claim: the transaction will create a diversified media and marketing company with combined revenues of $4.8bn, including $2.7bn from advertising revenues and approximately $700m from digital advertising. Advertising revenues constitute the most important source of revenue for media companies, therefore, it is important to assess this line item independently as it reflects a crucial distinguishing factor in the valuation of media companies. – Creating an unparalleled portfolio of national media brands and benefitting from economies of scale and efficiency which feed into cost synergies (previously described). The expansion of Meredith’s product portfolio will not cannibalize its existing product offering which enables the company to continue to grow and strengthen its local media business. At present, Meredith Corporation enjoys a 40% EBITDA margin and forecasts an even stronger margin in the upcoming years. – Acceleration of Meredith’s digital position due to the increase in scale and scope of operations. The firm’s leadership position will foster advertising revenue generation. – Providing advertising and consumer revenue diversification and growth as the company will be well positioned to benefit from fast growing digital advertising platforms. Additionally, it will achieve a more stable and diversified customer base which ensures greater revenue stability. – The enhancement of financial strength and flexibility. The deal will be accretive, mainly due to the fact that it is 100% cash financed. Meredith has demonstrated in its previous acquisitions to be a successful player in the integration and implementation of cost synergies. Therefore, investors are confident in its ability to optimize the cost structure of the combined entity. Its positive balance in free cash flows and the increased scale of operations from the acquisition of Time Inc. will help Meredith to pay down debt and achieve a leverage ratio of 2x by 2020 so to exploit future potential acquisitions to achieve future growth. – Given the strong track record of Meredith’s successful post acquisition integration strategies, investors are confident that the combined entity will be able in the implementation and realization of synergies. Therefore, there is a positive market sentiment regarding value creation in this transaction. – The offer price permits the acquiring company to extrapolate value from the transaction, resulting in a positive NPV transaction (because the offer price is lower than the true value of the combined entity). This translates into a well-defined and not too high acquisition premium. BDT & Company and Moelis & Company are serving as financial advisors to Meredith, while Bank of America Merrill Lynch and Morgan Stanley acted as financial advisors to Time Inc.